MILWAUKEE, March 5, 2015 – Baird ranks No. 5 on FORTUNE magazine’s 2015 list of the 100 Best Companies to Work For, an annual ranking of the top U.S. workplaces based on employee feedback and workplace attributes. Baird, an employee-owned international financial services firm, has been recognized on the list for 12 consecutive years and has ranked among the Top 25 for the past seven years. Among the many workplace attributes that the 100 Best Companies are evaluated for, FORTUNE specifically highlighted several that it says make Baird a great place to work. According to FORTUNE: Investment advisor has $120 billion in client assets and attributes success to CEO Paul Purcell's one rule: there are “no a**holes here.” Over the years roughly two dozen people have been terminated for breaking that rule. In 2014, Baird acquired McAdams, Wright, Ragen, a Seattle-based private wealth management firm, adding talented Financial Advisors and six offices to its footprint in the Pacific Northwest. In 2013, Baird formed the Fixed Income Institutional High-Yield Team, which researches, trades and sells corporate debt securities. With a talented team of professionals and Baird’s balanced platform of five strategic businesses, the firm has achieved significant performance milestones. In 2014, Baird achieved its fifth consecutive year of record revenues, posting revenues of $1.2 billion, up 12 percent over 2013. Baird’s client assets also increased to $145 billion, and the firm’s operating income totaled a record $135 million, up 15 percent from 2013. As a result, Baird’s return on book value – at 15.5 percent – is among the highest in the industry. To read more about Baird’s workplace attributes, see the Great Place to Work Institute’s Great Rated! profile of Baird. 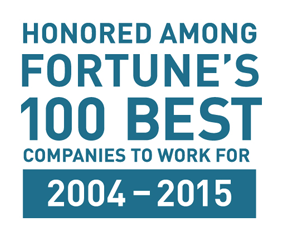 FORTUNE partners annually with Great Place to Work® to conduct the most extensive employee survey in corporate America to identify the 100 Best Companies to Work For®. Two-thirds of a company’s survey score is based on the results of the Trust Index© Employee Survey, which is sent to a random sample of employees from each company. This survey asks questions related to employees’ attitudes about management’s credibility, overall job satisfaction, and camaraderie. The other third is based on responses to the Culture Audit©, which includes detailed questionnaires about pay and benefit programs and a series of open-ended questions about hiring practices, methods of internal communication, training, recognition programs and diversity efforts. Baird is an employee-owned, international wealth management, capital markets, private equity and asset management firm with offices in the United States, Europe and Asia. Established in 1919, Baird has more than 3,100 associates serving the needs of individual, corporate, institutional and municipal clients. Baird has more than $145billion in client assets. Baird’s principal operating subsidiaries are Robert W. Baird & Co. in the United States and Robert W. Baird Group Ltd. in Europe. Baird also has an operating subsidiary in Asia supporting Baird’s investment banking and private equity operations. For more information, please visit rwbaird.com.